Remember When I was stuck on Rainbows…. Here is a good summary of what bush pilots think of these low pressure troughs that can hang around in an area for a while. Also, as I have said, I think these low pressure troughs are really decaying strings of vacuum energy from the Sun, they are in effect “gravity” decaying within our gaseous atmosphere. While they decohere and oscillate they can create all sorts of turbulence and fog and clouds through the creation of water vapor along with vacuum condensing, creating a challenge for pilots to navigate. Along with this they create beautifully deceiving rainbows as the light interacts with the condensation along their path. Uncertainty creates uncertainty. Summer weather for much of Alaska has thus far been dominated by “the low pressure trough.” What’s that mean for Alaska bush pilotsand aviators? Expect the unexpected over and around the state’s many mountain ranges and passes. Unstable air characteristic of low pressure troughs can produce sunny conditions or rain. Clouds or thunder. Fog or wind. To be honest, it’s a rather miserable weather pattern to deal with because forecasting a low pressure trough is at best difficult and at worst, pretty much a joke. The up-side? We see lots of rainbows like this one. 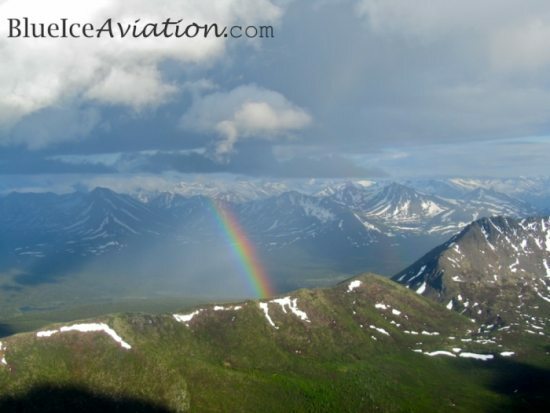 Photo taken in Southcentral Alaska’s Chugach Mountains near Klutina Lake in mid-July 2012. Matthew Keller is the owner and operator of Blue Ice Aviation. He was born and raised in Alaska and his office is the cockpit of his Super Cub. His goal is to transport everyone into Alaska’s vast wilderness. See more of his videos and writing at Blue Ice Aviation.